For other uses, see Farad (disambiguation). 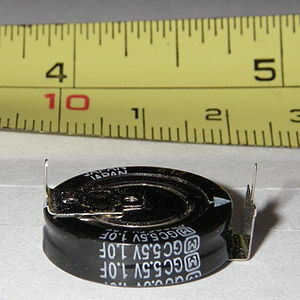 A one farad modern super-capacitor. The scale behind is in inches (top) and centimetres (bottom). The term "farad" was originally coined by Latimer Clark and Charles Bright in 1861, in honor of Michael Faraday, for a unit of quantity of charge, but by 1873, the farad had become a unit of capacitance. In 1881 at the International Congress of Electricians in Paris, the name farad was officially used for the unit of electrical capacitance. ^ The International System of Units (SI) (PDF) (8th ed.). Bureau International des Poids et Mesures (International Committee for Weights and Measures). 2006. p. 144. ^ Peter M B Walker, ed. (1995). Dictionary of Science and Technology. Larousse. ISBN 0752300105. ^ Sir W. Thomson, etc. (1873) "First report of the Committee for the Selection and Nomenclature of Dynamical and Electrical Units," Report of the 43rd Meeting of the British Association for the Advancement of Science (Bradford, September 1873), pp. 222-225. From p. 223: "The "ohm," as represented by the original standard coil, is approximately 109 C.G.S. units of resistance ; the "volt" is approximately 108 C.G.S. units of electromotive force ; and the "farad" is approximately 1/109 of the C.G.S. unit of capacity." ^ (Anon.) (September 24, 1881) "The Electrical Congress," The Electrician, 7 : 297. From p. 297: "7. The name farad will be given to the capacity defined by the condition that a coulomb in a farad gives a volt." ^ Tunbridge, Paul (1992). Lord Kelvin : his influence on electrical measurements and units. London: Peregrinus. pp. 26, 39–40. ISBN 9780863412370. Retrieved 5 May 2015. ^ Braga, Newton C. (2002). Robotics, Mechatronics, and Artificial Intelligence. Newnes. p. 21. ISBN 0-7506-7389-3. Retrieved 2008-09-17. Common measurement units are the microfarad (μF), representing 0.000,001 F; the nanofarad (nF), representing 0.000,000,001 F; and the picofarad (pF), representing 0.000,000,000,001 F.
^ Platt, Charles (2009). Make: Electronics: Learning Through Discovery. O'Reilly Media. p. 61. ISBN 9781449388799. Retrieved 2014-07-22. Nanofarads are also used, more often in Europe than in the United States. ^ Gregorian, Roubik (1976). Analog MOS Integrated Circuits for Signal Processing. John Wiley & Sons. p. 78. ^ Pease, Bob (2 September 1993). "What's All This Femtoampere Stuff, Anyhow?". Electronic Design. Retrieved 2013-03-09. ^ Pease, Bob (1 December 2006). "What's All This Best Stuff, Anyhow?". Electronic Design. Retrieved 2013-03-09. ^ Williams, L. L. (January 1999). "Electrical Properties of the Fair-Weather Atmosphere and the Possibility of Observable Discharge on Moving Objects" (PDF). Retrieved 2012-08-13. ^ "Puff". Wolfram Research. Retrieved 2009-06-09. ^ "1940 Catalog - Page 54 - Capacitors (Condensers)". RadioShack. Archived from the original on 11 July 2017. Retrieved 11 July 2017. ^ "Daraf". Webster's Online Dictionary. Archived from the original on 2011-10-04. Retrieved 2009-06-19. ^ Graf, Rudolf F. (1999). Modern Dictionary of Electronics. Newnes. p. 1. ISBN 9780080511986. Retrieved 2016-04-15. This page was last edited on 22 April 2019, at 13:49 (UTC).